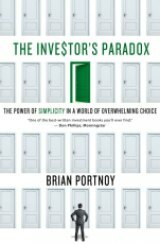 Toward the end of "The Investor's Paradox: The Power of Simplicity in a World of Overwhelming Choice" (Palgrave Macmillan, 256 pages, notes, index, foreword by Ted Seides, $27.00) beginning on page 183, author Brian Portnoy has a chapter entitled "Parsing Lake Woebegon." It's the place humorist Garrison Keillor describes so vividly in "A Prairie Home Companion" as a town where "all the women are strong, all the men are good looking and all the children are above average." What does this have to do in a book where an investment expert leverages insights from psychology, finance, and history to illuminate a path toward success in today's daunting markets? The "Lake Woebegon Effect" is very much in evidence in the world of fund management and investing generally, Portnoy says in a very readable book, adding that in a career devoted to picking winners, "I can't think of a single instance where a portfolio manager I was interviewing didn't tell me he was better than the rest." Portnoy reminds up -- as if we needed reminding -- that investors are in a jam. A troubled global economy, unpredictable markets, and a bewildering number of investment choices create a dangerous landscape for individual and institutional investors alike. To meet this challenge, most serious investors rely on a portfolio of fund managers. "The Investor's Paradox" describes a path toward simplicity in a world of dangerous markets and overwhelming choice. Written in accessible, jargon-free language, with a healthy skepticism of today's money management industry, it offers not only practical tools for investment success but also a message of empowerment for investors drowning in possibility. Portnoy delivers a powerful framework for choosing the right ones -- and avoiding the losers. Portnoy writes that the right answers are found by confronting our own subconscious biases and behavioral quirks. A paradox we all face is the natural desire for more choice in our lives, yet the more we have, the less satisfied we become -- whether we're at the grocery store, choosing doctors, or flipping through hundreds of TV channels. So, too, with investing, where there are literally tens of thousands of funds from which to choose. Hence "the investor's paradox": We crave abundant investment choices to conquer volatile markets, yet with greater flexibility, the more overwhelmed and less empowered we become. Leveraging the fresh insights of behavioral economics, Portnoy demystifies the opaque world of elite hedge funds, addresses the limits of mass market mutual funds, and discards the false dichotomy between "traditional" and "alternative" investments. He also explores why hedge funds have recently become such a controversial and disruptive force. It turns out it's not the splashy headlines -- spectacular trades, newly minted billionaires, aggressive tactics -- but something much more fundamental. The stratospheric rise to prominence and availability of alternative strategies represents a further explosion in the size and complexity of the choice set in a market already saturated with products. It constitutes something we all both crave and detest. If you're a serious investor -- or want to become one -- "The Investor's Paradox" is a must-read, and re-read, book. Brian Portnoy, Ph.D., CFA has been successfully researching, advising, and investing in hedge funds and mutual funds for the past fourteen years. He is currently the Head of Alternative Investments and Strategic Initiatives for Chicago Equity Partners, a $10 billion asset manager. Previously, Portnoy held senior roles at Mesirow Advanced Strategies and Morningstar, the world's premier research shop on mutual funds. He has spoken at numerous investing conferences across the U.S., Europe, and Asia, and has appeared frequently in major media outlets such as CNBC and the Wall Street Journal. Prior to his investing career, Brian pursued his research and teaching interests in political economy and markets at the University of Chicago, where he earned his Ph.D. in 2000. Brian Portnoy is a CFA Charterholder and a member of the CFA Society of Chicago.